Polar bear diorama at Anchorage airport: Julia WhittyI’m home from my cruise aboard the US Coast Guard icebreaker Healy and its science mission to study the effects of a changing climate on the Arctic Ocean. 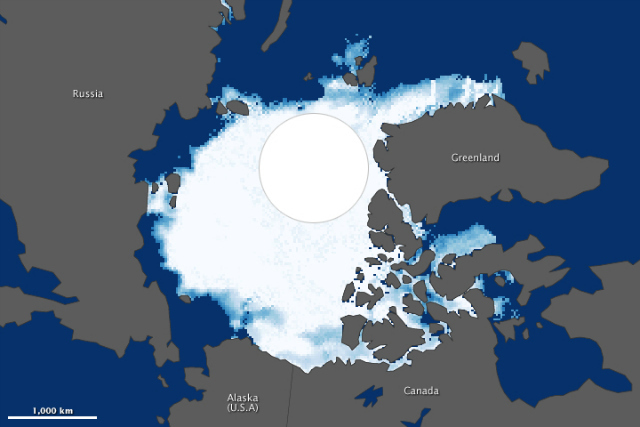 When I set out a month ago I never imagined that we’d never encounter any sea ice (I wrote more on that here). 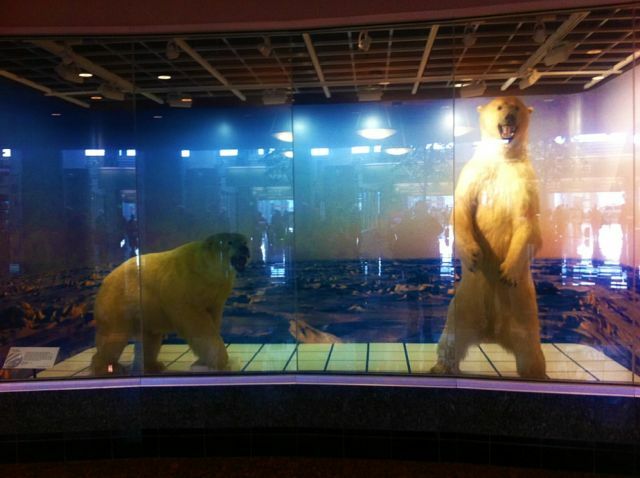 And that the only polar bears I’d see were these stuffed specimens on display at the Anchorage airport. Naturally I’m disappointed. But for the bears who couldn’t find any sea ice within 500 miles of Alaska, and for the seals who need sea ice to haul out onto for pupping, and for the Arctic foxes who make a living following polar bears across the ice, and for the ivory gulls who do the same, and for the people of the Western Arctic who rely on subsistence hunting, the situation may well have been desperate this year. 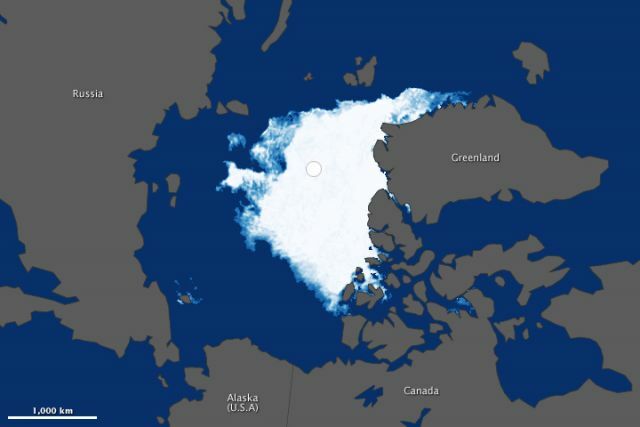 The 2012 Arctic sea ice minimum (top) compared to the 1984 Arctic sea ice minimum (bottom): NASA Earth ObservatoryThings are changing so rapidly in the Arctic. Yet we have few baseline data with which to understand these changes. Aboard Healy I watched every scientist working as hard as humanly possible just to try and catch up with events racing away from us. It reminds me of another monumental story I covered: disastrous change, few data, poor understanding, and the need to learn faster than we’ve ever learned before. That was BP’s Deepwater Horizon oil debacle in the Gulf of Mexico. 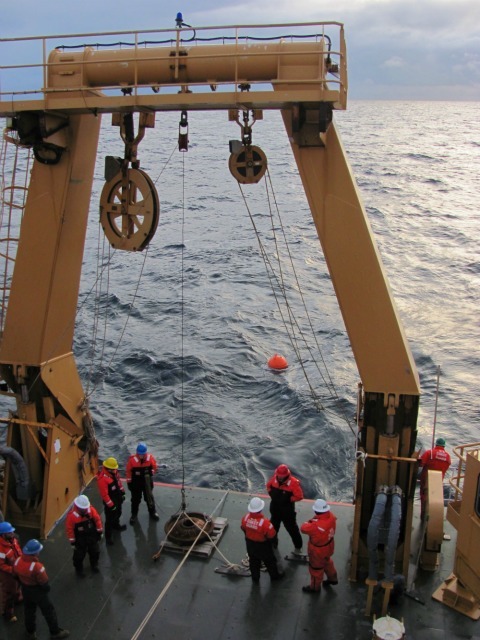 Science and Coast Guard crew work to deploy a mooring buoy from USCG icebreaker Healy in the Arctic Ocean, October 2012: Julia WhittyWhat I found most hopeful aboard USCGC Healy was the impressive cooperation between US military personnel—the hardworking Coast Guard crew—and scientists from around the world. They worked different aspects of this science mission. But it was clear they were working the same mission and shared many of the same concerns. I’ll be writing more about this cruise in the coming months, what the data are revealing, and what that might mean for our collective future as Earth’s climate continues to warm. Jeremy Mathis’ research aboard Healy is supported by the National Science Foundation, Office of Polar Programs. My personal thanks go out to Jeremy Mathis, to Bob Pickart at WHOI, Principle Investigator aboard, to Captain Beverly Havlik, Commanding Officer of Healy, and to all the science and Coast Guard crew who worked the Healy 1203 mission.